The details on exhaustees — the people have used up their total Unemployment benefits — are pretty daunting. I mentioned this to Doug Kass last week, who referenced our prior post on the subject at Real Money, and it caused quite a stir.Let’s explain what this means and update a chart on the subject.If you lose your job, you get Unemployment Benefits, an insurance program that you pay into so long as you are getting a salary. After 26 weeks, you will exhaust those benefits and become an exhaustee. 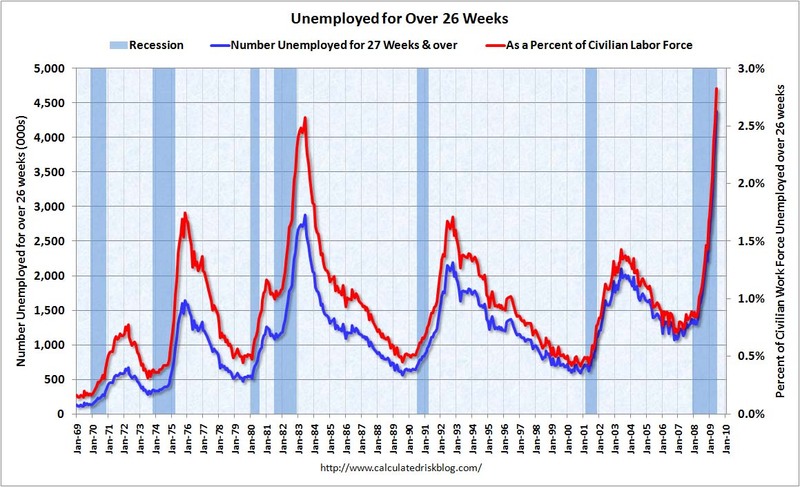 These days, via the stimulus plan, we have the Emergency Unemployment Compensation (EUC) which is good for 20 weeks. Then, there is the Supplemental EUC, which depending upon what your state thinks of the Federal largesse of handing out money to the recently unemployed, ranges anywhere from 13 to 20 more weeks. The most recent data run was for the week of July 11. As of that week, the Extendees — which consists of soon-to-be-Exhaustees — gained 25k, raising the total unemployed receiving extended benefits to about 2.66 million people. One year ago, there were only 127 thousand receiving extended benefits. And, as the NYT noted yesterday, there are another 1.5 million people likely to become Exhaustees over the next few months. . . .
2 Responses to "Extended Benefits and Exhaustion Rate (Updated)"
I wonder if this includes all the poor idiots like me who moved to a different state for a job that fell through while still collecting EUC in their original state (in this case from NY to Maryland), and then couldn’t find employment in the new state. I continued to collect from NY through the end of their EUC program, but when NY changed their laws to participate in the 100% federally funded Extended Benefits program, they only allowed me 2 weeks of extended benefits because I was longer living in NY state. Apparently when the state you moved to passes the appropriate legislation, one can collect the balance of the old state’s Extended Benefits. But Maryland, with much lower unemployment because of so many federal employees, will probably never change their laws or participate in the Extended Benefits program (or at least not until I’ve starved to death). How’s that for logic? NY State paid me unemployment for 59 weeks while they were footing the bill, but as soon as the Federal Government was paying for it, they cut me off. And I can’t collect in Maryland because I’ve never worked here. What’s wrong with this picture? And I live in Baltimore, where the unemployment rate far exceeds that of NY state or the country as a whole. God help me…I’ve been Catch 22’d. It would be funny if I didn’t have a badly disabled child and have lost my COBRA due to inability to pay the premiums. And as unbelievable as it sounds, the $630 a month I get from Social Security as an “aged widow” (I’m 61)is too much income for me to qualify for Medicaid. And it’s August and people like me are dying a death of a thousand wounds while the Maryland and U.S. legislatures are having their lovely summer vacations. For this my ancestor Thomas Sprague fought in the Revolution, and my great grandparents traveled by covered wagon from Maryland to Texas and lived through the Dust Bowl in the Texas Panhandle, because they believed America to be the land of opportunity. Two years ago I was a highly paid marketing executive in a global accounting firm…today I’m a bum with no hope and no prospects. Why? Because I’m over 60 (and with the job market entirely on the internet now it’s virtually impossible to hide your age), and I went to work instead of earning a college degree (apparently 40 years of hands-on progressive professional experience is far inferior to an English degree earned 40 years ago). End of rant…my gratitude is boundless if you stayed with me to the end!